Pete Wells reviews Guy Fieri's American Kitchen & Bar: critical masterpiece or malpractice? 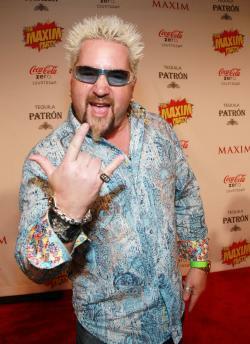 Guy Fieri enjoys Tabasco Buffalo Style Sauce At The Maxim Party at Indiana State Fairgrounds. Late yesterday afternoon, I read New York Times food critic Pete Wells’ evisceration of Guy Fieri’s new Midtown slop trough with unabashed glee. I had heard rumors of this fatty tumor growing in the heart of Manhattan, but hadn’t really thought much of it: I avoid Times Square (especially its always overpriced, always underwhelming restaurants), just as I avoid Fieri’s greasy, good-old-boy Food Network programs, at all costs. Which is to say, I was never in danger of eating at Guy’s American Kitchen & Bar; I did not need Pete Wells to guide me in that regard. What I was hungry for, however, was a chill-inducing piece of criticism—a thing which Wells delivered in spades. Then, predictably, there was a backlash. Of course Fieri’s restaurant is crap, people said, so why expend the energy and column-space to deal with it so harshly? From @MikeBodge: “NY Times absolutely brutalized Guy Fieri’s new restaurant today, but it’s a wasted review. Why not review Bubba Gump and Red Lobster too?” And since we supposedly live in a country divided between elitists and populists—Joshua Stein explained back in October that Fieri has built his career shamelessly pandering to the latter camp—some haughty New York reviewer isn’t going to persuade those REAL Americans anyway. The tyranny of “usefulness” is so tiresome. What if the purpose of Wells’ piece—and many other works of criticism, for that matter—isn’t to convince, to educate or, God forbid, to provide something as dull as service journalism? What if his review is merely an example of a talented writer responding to an offensive thing in a way that pleases him? If my quote-filled Facebook feed is any indication, he pleased many of his readers, too. To read Wells’ pan straight—that is, to take it as a traditional review concerned with balance, objectivity, and some amount of generosity—is to utterly miss the point. If I can borrow a term from drag queen parlance, this is a shady, shady read—i.e., a witty, artful put-down concerned not with meanness per se, but rather with displaying the skill of the creator. The extent of its success should be judged in those terms, on the merits of its style. Indeed, what Wells has done here is to stretch the limits of what food criticism is “supposed” to do—in the conservative Times, anyway. He has taken up Katie Roiphe’s assertion that, in an era when Yelp provides all the “good or bad” restaurant reviews we need, “the role of the true critic is actually quite simple: To write on a different level, to pay attention to the elements of style.” If the critic delights or enrages with well-crafted prose, she has done her job. Of course, not everyone thinks of criticism this way. Luke O’Neil mockingly asked in Bullett: “Is this entire review a very expensive piece of conceptual art?” My answer: In a certain sense, yes, that is exactly what it is. And? Wells, then, set before himself a daunting critical task: reviewing a restaurant that isn’t real. And he accomplished it with aplomb.